Lila B. Metzger, age 91, of Alliance, passed away at 12:20 p.m., Thursday, September 27, 2018, at Crandall Medical Center in Sebring. She was born October 19, 1926, in Toledo, Ohio, to Walter and Helen (Feeley) Kuenzle. Lila received her Bachelor of Science degree from the University of Toledo. She was a Registered Medical Technologist through the American Society of Clinical Pathologists and a member of Sigma Mu Tau Honorary and Kappa Delta Sorority. She was a former employee of Bryan Community Hospital and Mansfield General Hospital. Prior to her marriage in 1954, Lila was Chief Technologist and Head of Chemistry at St. Vincent Hospital in Toledo. 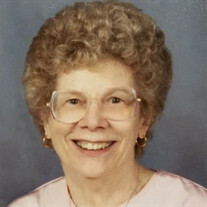 As a lifelong Lutheran, Lila sang in choirs, played piano and served as a Sunday School Teacher. She was a member of Abiding Savior Lutheran Church for the past 24 years where she was involved with the Women's Quilting Ministry, Nursery Packets Program, and College Care Packets. Lila enjoyed reading, hand-stitched quilting, and loved doing crossword puzzles. Before her marriage, she sang in the Toledo Choral Society. Survivors include her husband, Rev. James B. Metzger, whom she married September 18, 1954, at Augsburg Lutheran Church in Toledo; children, Robert (Janet) Metzger of Houston, Texas, John (Marcia) Metzger of Hudson, Wisconsin, and Karen Metzger of New York City; John's children, Owen Metzger of Madison, Wisconsin, and Lydia (Tim) Nevins of Des Moines, Iowa; and her sister, Leta Lauffer of Toledo. Lila was preceded in death by her parents and sister, Lois Kuenzle. Services will be held at 1:00 p.m. Monday, October 1, 2018, at Abiding Savior Lutheran Church with Pastor Angela Storer officiating. Friends may call the hour prior to the service at the church. Interment will be held at Fairmount Memorial Park.